Ergonomic tubular handle (4” above top shelf) with smooth radius bend for comfort and uniform appearance. 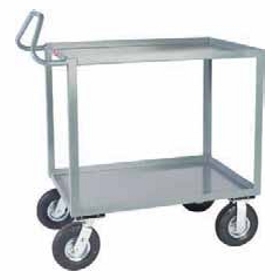 Bolt on casters, 2 swivel & 2 rigid — Semi or full pneumatic casters. Clearance between shelves — 25". Top shelf height — 39" (8" casters).